Joe Adcock smashed some of the longest home runs ever witnessed. Although measuring the distance home runs traveled has historically been an imprecise science, driven by myth and legend, Adcock belongs to a select few sluggers, among them Mickey Mantle, Frank Howard, and Willie Stargell, whose feats still inspire awe. As a vocal leader of the Braves during their halcyon days in Milwaukee, Adcock hit the first ball into the revamped center-field bleachers at the Polo Grounds and the first shot over the 83-foot-high grandstand onto the upper-deck roof in left-center field in Ebbets Field, and was the first right-hander to smash one over the 64-foot-high scoreboard in right-center field at Connie Mack Stadium. One of the most feared sluggers of the 1950s and early 1960s, Adcock became just the 23rd batter to slug 300 home runs and finished with 336 round-trippers in his injury-plagued career that was marred by years of platooning. Joseph Wilbur Adcock was born on October 30, 1927, in Coushatta, Louisiana, located about 45 miles south of Shreveport on the east bank of the Red River. His father was Ray Adcock, a businessman, farmer, and longtime sheriff of Red River County; his mother, Helen (Lyles) Adcock, was a teacher. Joe and his younger sister, Mary Ann, grew up on the family farm, where they were expected to help out with the chores by the time they were 7 years old. Adcock was a standout basketball player at Coushatta High, leading the school to the state Class B finals as a senior in 1944. Basketball coach Jesse Fatheree at Louisiana State University offered the 6-foot-4, 210-pound Adcock and two of his teammates scholarships to play on the hardwood for the Tigers. Like many colleges (and professional baseball) teams at the time, rosters were depleted because of World War II. Baseball coach A.L. “Red” Swanson took over the team when Fatheree was drafted into the service. “One time in the spring of my freshman year, I was watching the varsity baseball team practice,” Adcock recalled of his introduction to baseball.2 In desperate need of players, Swanson invited Adcock try out for the team. Adcock stumbled learning to throw and catch fly balls, but proved to be a good hitter with an eagle eye. “I was all hit and no field,” he recalled. “I’d never worn spikes. I’d never had a uniform. I never played a game with nine men on a side.”3 Adcock’s first love remained basketball; he led the Southeastern Conference in scoring (18.6 points per game) in the 1945-1946 season and had offers to play professionally.4 On the diamond he established his reputation as a right-handed slugger and capable first baseman. Adcock attracted scouts during his junior year when he helped lead the Tigers to the Southeastern Conference championship. Cincinnati Reds scout Paul Florence signed him to a contract in 1947. Adcock began his professional baseball career as a 19-year-old in Columbia, South Carolina, playing for the Reds’ affiliate in the Class A South Atlantic (Sally) League. The second youngest player on the team, Adcock batted .264 with a .414 slugging percentage and earned an invitation to the Reds’ spring training in 1948. Among the first cut from camp, Adcock returned to Columbia, where he improved his average to .279 (though his slugging dropped about 30 points), and was named to the Sally League’s midsummer all-star team. He also suffered a knee injury, the first of many injuries that plagued him throughout his career. After another look-see at Reds spring training in 1950, Adcock was assigned to the Tulsa Oilers in the Double-A Texas League. Still a raw fielder, Adcock worked closely with manager Al Vincent to develop his technique. “He changed my whole style,” said Adcock of Vincent. “I started from scratch with him and he taught me everything.”5 Playing with a knee brace, Adcock emerged as one of most promising young sluggers in the league, belting 41 doubles and 19 home runs to go along with a sturdy .298 average for the league champions. Adcock secured a Reds roster spot in 1950 but encountered a serious problem. An emerging star, big Ted Kluszewski, seemed to be the club’s first sacker of the future, leaving Adcock without a natural position. Adcock’s three seasons with the Reds were subsequently filled with frustration, missed opportunities, and injuries. Adcock’s impressive debut as a 22-year-old first baseman against the Pittsburgh Pirates on April 23 (2-for-4 with a double) was followed by an embarrassing outing early in the game the next evening. “I’m sitting on the bench … before the game,” he recalled, “and [manager] Luke Sewell throws me a glove and says, ‘You’re playing left field.’ It was the first time in my life that I ever had a fielder’s glove. The first groundball hit to me should have been held to a single, but I had to chase it all the way to the wall.”6 Struggling at the plate through June in limited duty, Adcock showed that he could hit big-league pitching in a six-game stretch (10-for-24) in early July, then replaced the weak-hitting Peanuts Lowrey in left field after the All-Star Game. From July 5 through the end of the season Adcock hit a team-high .315 (102-for-324) and earned a berth on The Sporting News Rookie All-Star team. Firmly ensconced as the Reds’ left fielder in his sophomore season, “Billy Joe” (a nickname he earned from Dodgers announcer Vin Scully) gradually replaced Kluszewski as the cleanup hitter. Batting a respectable .281 and slugging a team-best .489 during the first seven weeks of the 1951 season, Adcock injured his right knee and ankle while sliding into second base against the Boston Braves on June 3, foreshadowing a much more serious incident six years later. After missing more than three weeks of action, Adcock slumped in his return (he batted just .212 after the injury) and fielded tentatively. By his third season, Adcock was vocal in his opposition to playing left field because of his home park’s distinctive embankment, which bothered his knees. “Every player who came into Crosley Field,” said the New York Giants Bobby Thomson, “paid attention to … the unique outfield terrace that ran in front of the left and center field walls.”7 Increasingly moody, Adcock got off to a hot start (batting .333 and slugging .667) when he aggravated his knee injury on May 22 in Brooklyn, missing three weeks. Hobbled in his return, his average steadily declined to .278 by season’s end with little power. He clashed with Rogers Hornsby (the club’s third manager during the season), who desired a more athletic and speedy left fielder.8 Adcock wanted to play first base, but with just 31 home runs in his first three seasons, he failed to show the consistent power to dislodge Kluszewski, a consistent .300 hitter who had hit 54 home runs during the same period. On February 16 Adcock was traded to the Braves, at the time officially located in Boston, in a complicated four-team, five-player plus cash deal. Adcock’s aggressive style of play appealed to manager Charlie Grimm. “Adcock is my kind of player – a holler guy,” said Jolly Cholly.10Adcock’s first home run for the Braves was a prodigious 475-foot blast against the New York Giants at the Polo Grounds on April 29.11 He launched a pitch from Jim Hearn that landed ten rows up on the left side of the center-field bleachers; he was the first player to do so since the ballpark was renovated in 1923. Another titanic shot, against the Pittsburgh Pirates on July 18, rocketed almost as far, clearing the 457-foot sign in cavernous Forbes Field just to the left of straightaway center. Just as important as Adcock’s 18 home runs and 80 runs batted in for the season were his durability (he played in all of the team’s 157 games) and his fielding. “He has a good pair of hands and shifts well,” said Grimm, a former first baseman with the Cubs.12 The surprising Milwaukee Braves finished in second place and led the National League in attendance. A classic pull hitter, Adcock crowded the plate with a locked-in stance and took a big step into the ball, which left him vulnerable to getting hit with inside pitches. Sportswriter Red Smith wrote, “National League strategy insists that he can’t pull the ball if it’s close to his wrists,”13 but Adcock continued to make headlines with his slugging in 1954. The power-hitting Braves challenged the supremacy of the Brooklyn Dodgers and their ensuing rivalry throughout the decade proved to be one of baseball’s fiercest. On July 31 Adcock became just the seventh big leaguer to belt four home runs in one game when he victimized four Dodgers pitchers at Ebbets Field. “I hit a fastball for the first homer, a slider for the second, a curve for the third, and a fastball for the fourth,” he told The Sporting News.14 He also hit a double to set a then major-league record for 18 total bases in one game. In the following game Brooklyn reliever Clem Labine beaned Adcock on the left side of the head. The “distinct thud” heard throughout Ebbets Field came from Adcock’s’ batting helmet, still a relative novelty at the time, but which sportswriters quickly noted may have saved his life.15 “When they throw at me high and tight,” said Adcock, “I can duck, but when they throw behind your head, they mean business.”16 The Braves’ next series in Brooklyn proved to be even more dangerous for Adcock. On September 10 the big right-hander walloped his ninth home run of the season in Ebbets Field to set a new record for visiting players. In the first inning of the next game, Don Newcombe plunked the slugger, breaking his right thumb and ending his season during the Braves’ stretch drive. Adcock finished with 23 home runs, 87 RBIs, and a career-best .308 batting average. Given 3-1 odds against winning the World Series in 1956, the Braves got off to a slow start, leading to Grimm’s replacement by Fred Haney after 46 games. In his first game as manager, Haney scrapped Grimm’s plan of platooning the slumping Adcock at first base with Frank Torre. Adcock responded by belting two home runs in the first game of a doubleheader on June 17 in Brooklyn. His second blast, one of his record 13 against the Dodgers and the game-winner in the ninth inning off Ed Roebuck, was the first ball ever to soar over the 365-foot mark in left-center field, clear a height of 83 feet, and land on the double-deck roof of Ebbets Field before rolling off into a parking lot on Montgomery Street. A notoriously streaky hitter, Adcock assaulted pitchers for an NL-record 15 home runs and 36 runs batted in during the month of July which included “one of baseball’s wildest scenes” in memory.18 Adcock, increasingly angered by what he perceived as “head-hunting,” charged the mound on July 17 at County Stadium after New York Giants pitcher Ruben Gomez hit him on the wrist. In the ensuing melee, Gomez threw another ball at Adcock, striking him in the leg. Adcock then chased Gomez into the Giants’ dugout, where by some accounts Gomez found an ice pick but was wrestled to the ground by teammates before he could return to confront Adcock. 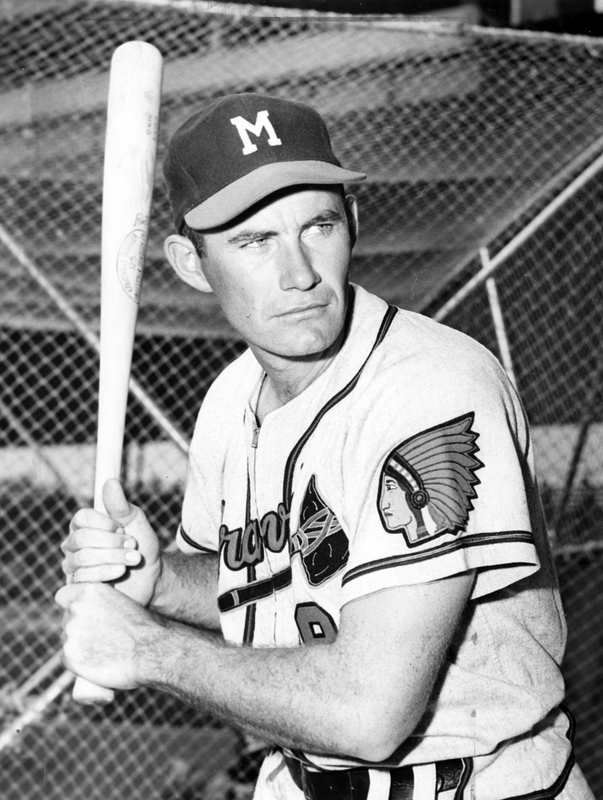 Two days later Adcock took revenge by clouting two home runs, including one of his ten career grand slams, and driving in a career-high eight runs in a 13-3 Braves victory. The Braves seemed to be headed for their first pennant in Milwaukee, but struggled down the stretch (14-13 in September) and lost the pennant on the final weekend of the season. Adcock enjoyed arguably his best season, ranking second in the NL in home runs (38), RBIs (103), and slugging percentage (.597). The Braves rewarded Adcock’s success with a rare two-year contract worth a reported $25,000 annually.19 But the big slugger was injury-plagued during the ensuing three years and ultimately forced into an unwanted and frustrating platoon role with Frank Torre. The initial injury occurred 33 games into the 1957 season when Adcock (batting .306 and slugging .562) tore ligaments in his right knee against the Chicago Cubs on May 26. He returned to the starting lineup on June 5 and played through the pain but was platooned thereafter. Adcock’s season came crashing down in a game against the Philadelphia Phillies on June 23 when he fractured his right fibula and tore ligaments in his right ankle sliding into second base in an awkward manner trying to protect his already-injured knee.20 Adcock returned to the Braves roster in September, but was noticeably hampered in the field as the Braves cruised to their first pennant in Milwaukee. In the World Series against the New York Yankees, Fred Haney followed script by platooning Adcock against left-handers and Torre against right-handers with the exception of Game Three. Adcock started Games One, Two, Three, and Five, but was replaced in the late innings in each game by Torre. Just 3-for-15 in the series, Adcock did line an opposite-field single to right off Whitey Ford to drive in Eddie Mathews in the sixth inning for the only run in the Braves’ 1-0 victory in Game Five. Adcock was forced into the uncomfortable role of fan in the final two exciting games as the Braves captured their first and only championship in Milwaukee. Adcock was confident that the Braves would capture another pennant in 1958. “We could run away with this thing like the Dodgers did in 1955,” he told Lou Chapman of the Milwaukee Sentinel. “There isn’t a ballclub that can touch us outside of Los Angeles.”21 In Haney’s platoon system, Adcock played first base primarily against left-handers and started just 71 times; however, when left fielder Wes Covington went down with an injury in June, the big Louisianan took over his spot. “That’s a lot of pasture out there,” said Adcock in his folksy Southern accent. “You could run several head of cattle out there in all that territory. But we’re hurting and I’m going to try to do my best. Let’s face it, though, I’m not happy about it.”22 Seeing his first action in the outfield since 1952, Adcock started 24 times despite a painful right knee, which had not fully recovered from the injury the previous year and required surgery following the season. “I couldn’t swing a bat right [in 1958],” said Adcock. “Whenever I put pressure on my back leg, out would go the knee. I didn’t play a game when my leg didn’t lock up on me six to eight times.”23 A team-first player, Adcock complained neither about his role on the team nor his pain. In just 320 at-bats, he belted 19 home runs and slugged .506 to help the Braves secure their second consecutive pennant. In a rematch of the previous World Series, the Braves and Yankees squared off again in 1958. Adcock started Games One, Four, and Six against Whitey Ford, while Torre started the other contests. In Game One Adcock went 2-for-5 and scored the winning run on Bill Bruton’s single in the bottom of the tenth inning to give the Braves an exciting 4-3 victory. With a three-games-to-one lead, the Braves were on the verge of another championship, but lost three consecutive games during which they struck out 25 times and scored just five runs. In the Series, Adcock went 4-for-13 with no runs batted in; Torre had three hits in 17 at-bats with one RBI. “I don’t like playing one day and sitting on the bench the next,” said Adcock during a 1959 spring training marred by a holdout and trade rumors. “I can’t do either myself or the team justice.”24 Adcock’s relationship with Haney became increasingly acrimonious. He once again split his time at first base and left field. In one of baseball’s most memorable games, Harvey Haddix of the Pittsburgh Pirates had a perfect game through 12 innings at County Stadium on May 26. In the 13th inning, with Felix Mantilla on second base courtesy of an error and Hank Aaron on first via an intentional walk, Adcock uncorked the first Milwaukee hit of the game, a towering home run to right-center field. Mantilla scored the winning run; however, in the ensuing melee, Aaron scampered to the dugout after rounding second base while Adcock circled the bases. Adcock was later ruled out for passing Aaron and his home run was scored a double. Three days later Adcock supplied another walk-off game-winner under bizarre circumstances when, as Gene Conley of the Philadelphia Phillies attempted to walk him intentionally, he “reached out over the plate a plucked a dribbler” to drive in Aaron on a fielder’s choice.25 Enjoying his best health in three years, Adcock put together a career-best 20-game hitting streak en route to 25 home runs while playing in just 115 games. In the team’s two straight losses in a best-of-three playoff against the Los Angeles Dodgers to determine the pennant winner, Adcock’s big bat was silent with no hits and two strikeouts in four at-bats. Adcock returned to first base in 1960 under new manager Chuck Dressen, and never played in the outfield again in his career. On April 14 he blasted a titanic shot off Curt Simmons that soared over the 390-foot mark in right-center field in Connie Mack Stadium in Philadelphia, becoming the first right-hander (and just the third player) to clear the 64-foot-high scoreboard. Asked about his estimated 500-foot home run, Adcock responded, “I hit one off Seth Morehead [on September 3, 1958] that went over the roof in left center. That’s even higher than the scoreboard and just as far.”26 “Billy Joe” never lacked confidence. For the first and only time in his career, Adcock was named to the All-Star team; he started both games of the midsummer classic and rapped three hits in five at-bats. (From 1959 to 1962 two All-Star Games were played each season.) Consistent all season, Adcock led the team with a .298 batting average accompanied by 25 round-trippers while the Braves finished in second place for the fourth time in eight seasons. Adcock was an accomplished and underrated first baseman whose long arms helped him dig out errant throws. He led first basemen in fielding percentage four times, including three consecutive seasons (1960-1962), and retired with the third-highest fielding percentage (.994) at first base in major-league history. The Braves were in transition in 1961, though it might not have been apparent at the time. The oldest team in the National League, they got off to poor start, sported a losing record at the All-Star break for the first time since their move to Milwaukee, and needed a surge in August to finish in fourth place at 83-71. More disconcerting to owner Lou Perini was the rapidly declining attendance, which reached its nadir the following two seasons at just over 9,400 per game after leading the NL in attendance for six consecutive seasons (1953-1958). Like his team, Adcock struggled, too, before his bat awoke in the second half of the season (21-for-62, .330) to finish with a team-high 35 home runs and career-best 108 RBIs. On June 8 against the Cincinnati Reds, Mathews, Aaron, Adcock, and Frank Thomas belted a record four consecutive home runs in the eighth inning (since accomplished twice in the American League). Aaron (34), Mathews (32), and Adcock became the first Braves trio to each blast 30 home runs in the same season. At the age of 34, Adcock showed signs of slowing down in 1962. His precarious right knee limited him to just 112 starts at first base, and he completed just 45 of them. He had difficulty running, but still possessed his awe-inspiring power. On July 21 in Philadelphia, he smashed two home runs, the second of which, reported the Milwaukee Journal, soared “over the roof atop the double-decked stands in left center” at Connie Mack Stadium.27 With rumors of his impending trade widely circulating by season’s end, Adcock concluded his final season in Milwaukee with 29 home runs and slugged over .500 for the seventh consecutive season. In their nine years together, Adcock (221), Aaron (298), and Mathews (327) belted 846 home runs, just nine fewer than the Dodgers trio of Duke Snider, Gil Hodges, and Roy Campanella had in ten years. In a trade widely criticized by sportswriters and fans, the Los Angeles Angels completed a trade of popular outfielder Leon Wagner for Adcock and pitcher Barry Latman on December 6, 1963. Reunited with Haney, then GM of the Angels, Adcock played his final three seasons in Southern California. Still a valuable home-run threat, he platooned at first base and pinch-hit. The Sporting News wrote that Adcock retained his boyhood enthusiasm for the game, ran out every grounder despite his aching knees, and was an unselfish player who tutored young hitters.31 On August 27 he reached a milestone when he launched a pitch from Diego Segui of the Kansas City Athletics for a home run at Municipal Stadium, becoming at the time just the 23rd major leaguer to belt 300 home runs. Playing home games in cavernous Chavez Ravine (Dodger Stadium), Adcock led the Angels in round-trippers in 1964 with 21 in just 366 at-bats. He concluded his playing career in 1966, the Angels’ inaugural season in the more batter-friendly Anaheim Stadium. He paced the team with 18 four-baggers (in just 231 at-bats) and launched two of longest home runs in his career. On July 4 he blasted a pitch from Mickey Lolich of the Detroit Tigers into the upper deck just under the left-field roof at Tiger Stadium; and on September 2 he walloped a pitch from Washington Senators reliever Bob Humphreys off a light tower in deep left field at Anaheim Stadium. Adcock retired as a player after the 1966 season to become manager of the Indians. “The boys can expect me to be strict and I’ll stress fundamentals,” he said. “I think there are a lot of mental errors made that shouldn’t be.”32 He lasted only one season (an eighth-place finish), and was replaced by Alvin Dark. Adcock piloted the Triple-A Seattle Angels in the Pacific Coast League in 1968 before walking away from the game he loved. In his 17-year big-league career, Billy Joe hit 336 home runs, knocked in 1,122 runs, and batted .277. Adcock retired to his hometown of Coushatta, where he had purchased Red River Farms as a player and spent most of his offseasons. He bred thoroughbred racing horses and was involved in farming. Adcock lived with his wife, the former Joan James, whom he met after his hand and wrist injury in 1955 when she worked as a nurse for the Braves team physician, Dr. Bruce Bower. They married in November 1956 and raised four children.33 Adcock gradually drifted away from baseball, though he periodically appeared at events commemorating the Milwaukee Braves. In 1975 he was inducted into the Louisiana Sports Hall of Fame. Suffering from the effects of Alzheimer’s disease, Joe Adcock died on May 3, 1999, in Coushatta. He was 71 years old. He was buried in Holly Springs Cemetery in Marin, Louisiana. 1 The Sporting News, March 11, 1953, 7. 3 The Sporting News, March 11, 1953, 8. 4 Louisiana Sports Hall of Fame. lasportshall.com/inductees/baseball/joe-adcock/?back=inductee. 5 Walter John, “Joe Adcock, Ex-Columbia Red, May Stick With Cincinnati,” News and Courier (Columbia, South Carolina), April 14, 1950, 9. 6 The Sporting News, March 11, 1953, 8. 7 William A. Cook, Big Klu. The Baseball Life of Ted Kluszewski (Jefferson, North Carolina: McFarland, 2012), 43. 9 The Sporting News, February 25, 1953, 15. 10 The Sporting News, April 8, 1953, 14. 11 The Sporting News, May 6, 1953, 11. 12 The Sporting News, May 13, 1953, 3. 13 Red Smith, “Joe Adcock Philosophical About Injury Jinx,” Milwaukee Journal, August 4, 1955, 19. 14 The Sporting News, August 11, 1954, 13. 15 Bob Wolf, “Adcock is Beaned; Burdette Robinson Feud Flares Again,” Milwaukee Journal, August 2, 1954, 15. 16 The Sporting News, August 11, 1954, 19. 17 Red Smith, “Joe Adcock Philosophical About Injury Jinx,” Milwaukee Journal, August 4, 1955, 19. 18 “Joe Adcock Hit-Run Victim of Fast Moving Gomez,” (Associated Press) Miami News, July 18, 1956, 11. 19 The Sporting News, January 23, 1957, 24. 20 Bob Wolf, “Braves Beat Phillies Twice. Adcock Breaks Bone in Leg,” Milwaukee Journal, June 24, 1957, 15. 21 Lou Chapman, “ ‘We Could Run Away With Flag, Maybe by 12’ – Adcock,” Milwaukee Sentinel, April 14, 1958, 7. 22 Lou Chapman, “Braves Ask OK to Place Buhl on Disabled List,” Milwaukee Sentinel, June 22, 1958, 28. 23 “Unhappy Adcock Asks Duty Every Day for Champs Braves,” (Associated Press) Reading (Pennsylvania) Eagle, March 28, 1959, 7. 25 Cleon Walfoort, “Braves Parlay Careless Conley, Alert Adcock for Winning Run,” Milwaukee Journal, May 30, 1959, 7. 26 “Big Joe and Booming Bat Make History With Homer,” Milwaukee Journal, April 15, 1960, 16. The first two batters to clear the scoreboard were Wes Covington and Carl Sawatski. 27 “Adcock's Two Home Runs Help Spahn Beat Phillies,” Milwaukee Journal, July 22, 192, 23. 28 Joe Reichler, “Joe Adcock Gone, Burdette is Next,” (Associated Press) Ocala (Florida) Star Banner, November 28, 1962, 10. 29 Milton Gross, “Joe Adcock Can’t Figure Braves,” Miami News, March 16, 1963, 22. 30 “Joe Adcock Key Figure in Five-Man Deal with Indians,” (United Press International) Washington (Pennsylvania) Reporter, November 28, 1962, 19. 31 The Sporting News, June 27, 1964, 19. 32 “Joe Adcock Chosen As Cleveland Manager,” (Associated Press) Palm Beach Post, October 4, 1966, 18. 33 “Joe Adcock, Joan James Are Wed Two Days Early,” Milwaukee Journal, November 16, 1956, 1.